This microphone connects to your iOS device's 30-pin dock connector. Though it mimics the iPhone 4's aesthetic, its plastic silver trim doesn't immediately scream quality. On the bottom edge is a headphone socket to take input from devices - including musical instruments - with a line out. On the right side is a mini USB port, through which your iOS device can be kept powered up from an external battery. But the port isn't wired for syncing data with a PC or Mac, so you'll need to detach Mikey to connect a different cable for that. The mic pivots through more than 180° to face the source of sound. The only physical control is a three-position gain switch. Auto mode proved extremely sensitive when surrounded by noise. Even a light brush of the iPhone's body triggered a light show from the three red LEDs that indicate the input is being clipped. Setting the gain switch to deal with loud noises fixed this by lowering the input's gain. Even speech next to a busy road was clear, though it inevitably became much quieter in the process. Make sure you have an app such as GarageBand in case you need to boost it in post-production. 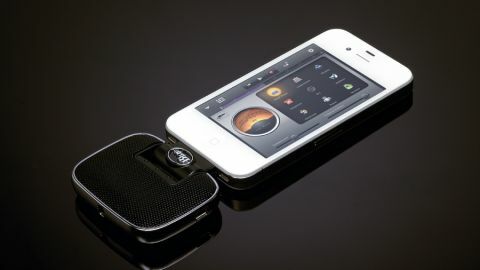 It's designed for iPhone 4 and 4S, fourth-gen iPod touch running iOS 6, and iPad 2 and 3. Blue doesn't mention iPhone 5, but we had no trouble using the mic with Apple's £25 adaptor. Inevitably, that makes the mic protrude further from the phone, and while that's ungainly, it isn't a bothersome issue in practice.